I’ve been trying to figure out how to balance history and future when it comes to revamping my offensive playbook; after a ton of hours in the film room, I think the Wing-T is gonna be back in vogue soon! I really do. Think about how mobile quarterbacks are being used! The world needs more running plays. Regardless of arm strength and accuracy, everyone thinks that being a trendsetter is always discarding the past. What if I told you that I found a weapon this week that is both a relic of a bygone era, as well as a nod to the future, all in the same thing? Read on, folks! What is it? Imagine a pistol that shoots little teeny-tiny rockets instead of bullets. Cool, huh? The GyroJet was developed in the 1960s by MBAssociates, a small arms company founded by scientists Robert Mainhardt and Art Biehl. 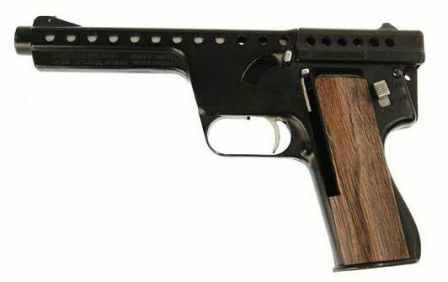 Unlike traditional handguns, which shoot bullets that are themselves inert, the GyroJet was a weapon that shot small-caliber rounds that had a micro-charge in them, allowing them an additional burst of propulsion after the initial firing. Conventional bullets exit the barrel of the gun at their top speed and then decelerate towards the target, while the Microjets begin at a slow speed, then engage a charge that lasts for about one-tenth of a second, which allows them to build acceleration as they travel towards the target. The GyroJet was envisioned in a variety of manners, including as a pistol, carbine, rifle, and as a fully automatic weapon as well; of these, pistols and carbines were built for the commercial market, but the rifle, which underwent extensive testing with the US military, remained a prototype only. A fully automatic weapon was never constructed in real life, unfortunately, although designs do definitively exist. The GyroJet was a very “futuristic” design in the heady Cold War era, and you can see the use of them in the classic Bond film You Only Live Twice, from 1967; they don’t look much different from conventional arms, but from observing the rifle, which is shot right at the very end of this clip (2:37), you can see a few subtle differences. Based on the exit velocities of a conventional .45-caliber bullet compared with a similarly sized rocket, GyroJet projectiles were estimated at having twice the kinetic energy of conventional bullets (with terminal velocity estimated around 1250 feet per second – slightly over Mach One) – allowing them to theoretically do twice as much damage. Besides the GyroJet, MBA also worked on a number of other projects, including the FinJet, which was the forerunner to the GyroJet. Similar in concept, the Finjet featured tiny steel-tipped needle-like rockets with miniature fins on them; in another very Bond-like concept, there were some design ideas to have rockets that could completely burn up or dissolve in a person’s bodily fluids, leaving no trace. After MBA got out of the business of designing and manufacturing the FinJet and GyroJet, they went on to design and manufacture a variety of non-lethal weapons, including bean-bag cannons. The “Gyro” in the GyroJet name comes from “gyroscope”, referring to the stabilization needed for rockets to be fired accurately; MBA initially had the idea of fins in their first design, now known as the FinJet, but ultimately opted instead for diagonally-spaced ventilation ports on the sides of the barrel, in order for the rocket to have equal amounts of thrust on all sides when the charge was ignited. While the design does in fact work, it proved to be very finicky in real life. The rockets were less accurate than conventional bullets due to the finicky nature of spiral stabilization, and as a result, the shooter needed a clear line of sight to the target. Additionally, because the rocket left the barrel of the gun at a slower speed than a conventional bullet (before speeding up), it was more susceptible to crosswind and other accuracy issues. The design and manufacturing process for the barrel of each gun was insanely finicky, with precision that was virtually impossible to achieve with the technology of the day. A later model reduced accuracy of the rockets further due to a design flaw in the barrel where one of the ventilation ports was partially blocked, resulting in uneven thrust being applied to the rocket, sending it corkscrewing through the air. The weapons were designed with a 1% failure rate, but actual usage was much higher than that, despite the comparatively simple mechanics of a GyroJet firearm compared to a conventional one. Barrels also tended to wear out much faster than on conventional firearms. The ammunition was incredibly expensive to produce – much more so than conventional bullets due to the need to provide rocket fuel for each round. This made its cost impractical to most consumers/users. Due to only being able to load one round at a time (despite most guns having a six-shot magazine), the US military felt that the weapon wasn’t suitable enough for combat usage due to taking too long to completely re-load. Honestly, the design wasn’t a total failure. I mean that. A flare-gun version of the GyroJet was standard-issue in emergency survival kits for USAF personnel for many years, because the rocket was able to reach much higher heights than conventional bullets and flares due to the added propulsion. MBA even invented a spear-gun version for underwater usage, which is pretty cool, if you ask me. Given the advances that have been made in manufacturing technology, is it unreasonable to suggest that a new version of the GyroJet could be made more consistent with better equipment for producing barrels, and that automation might allow for a reduced cost of ammunition? And at any rate, if it is cheaper and more accurate… add a laser to it. Lasers are just cool, even if they’re technically unnecessary. Just like flea-flicker passes. If you have 20 minutes of your day to kill, there’s a cool YouTube video on the GyroJet, which I’ve included below. Don’t watch it in the film room, though! I’m busy looking over my 3rd-and-long plays. Thinking about running it up the gut as a trick there. Nobody will expect that! I like how these provide daydream fodder for really ironic suicides! And at any rate, if it is cheaper and more accurate… add a laser to it. Lasers are just cool, even if they’re technically unnecessary. I don’t know, Marty, someone tried adding a laser to Tom Brady’s helmet and all it did was get them banned from Arrowhead and brought up on criminal charges. Gyro Jet was the failed marketing campaign New Yorks front office worked up in case they signed Tony Pashos. I thought Gyro Jet was what happens when you eat bad Greek food. What about the fart gun? Good work here. I like it when the concept is good, but then putting into practice with conventional technology just doesn’t work, sometime doesn’t work with spectacular failure. I guess you could say that could be true of me sleeping with Ana de Armas; her sleeping with “a certain” male is a reasonable concept. Lets fire something with rocket fuel from an object in you hand. What could go wrong. But can you stick it on the head of a shark? If you put some spin on it.